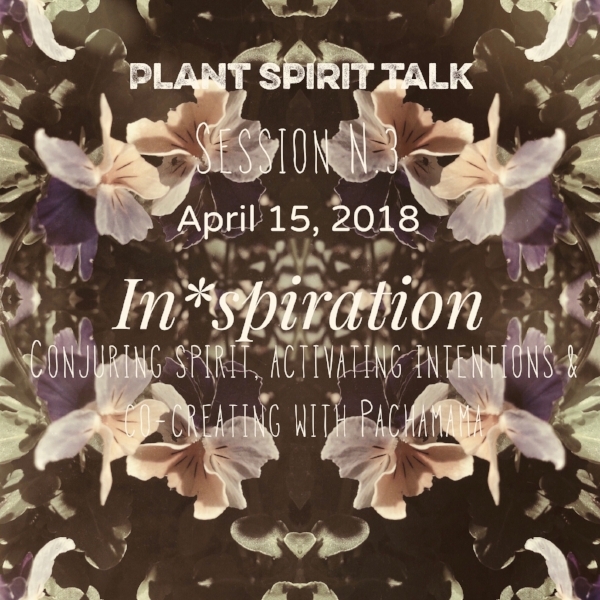 You are invited to join us for this one hour informational gathering to get a taste of the journey of Plant Spirit Talk course. We will go over material and syllabus for the individual sessions, full course and post-course Medicine Immersive Journey to the Peruvian Amazon. You will get a chance to ask questions, meet other prospect participants and sign up for the course. Registration for this gathering is required as there's only a limited number of seats available. To sign up, please click here and leave your name and email. Once registered, you will receive details and directions. Come join us for an evening of delicious exploration and celebration of the magic, power and beauty of our hearts. We’ll discuss ways to connect with the medicine of our love and passion to heal ourselves and our lives. We’ll learn about some beloved herbal companions that can nourish, inspire, strengthen, and support the wellness of our cardiac organ. 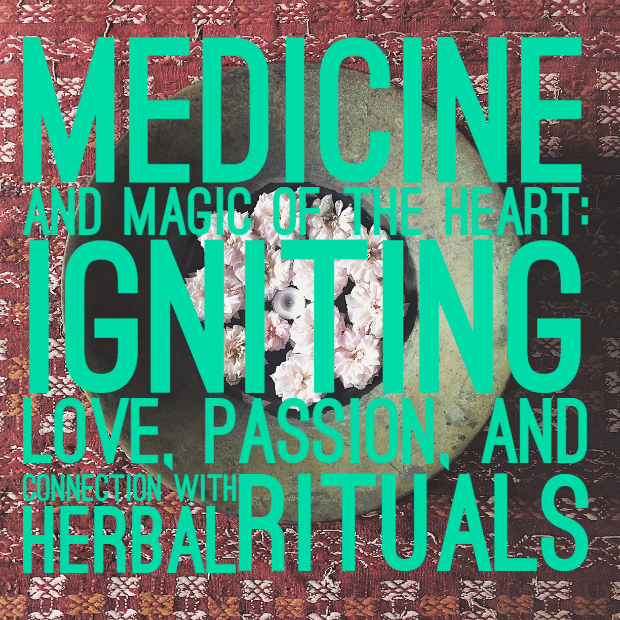 We’ll also dive into self-care practices for a “heart led/ heart healthy” lifestyle as well as make luscious potions for love, healing and connection. 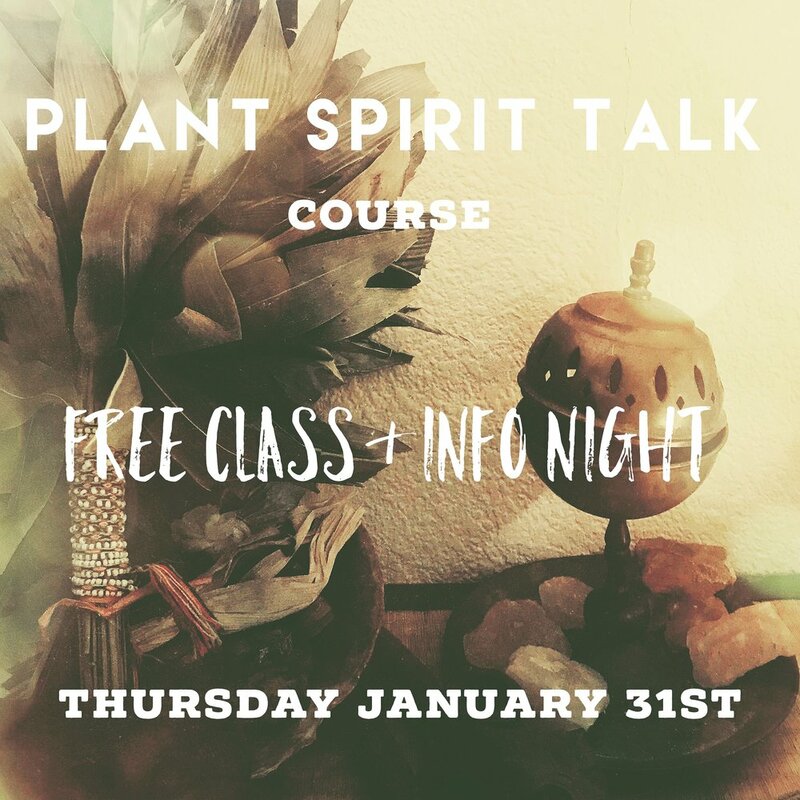 You are invited to join us for this free 2 hour introductory class and get a taste of the journey of Plant Spirit Talk course. In this class we'll be sharing: *How cultivating our relationship with the spirits of plants can usher us to a deepened relationship with our wise selves and our medicine. *Introduction and overview of the pillars of healing and harmonious living, based on South American cosmology. *Tips on how to create a daily practice for clearing and managing our energy with rituals and plants . We will meet at the location where the course is held, in beautiful Sebastopol. You will get a chance to ask questions, meet other prospect participants and sign up for the course. Registration for this class is required as there's only a limited number of seats available. To sign up, please follow this link and leave your name and email. Once registered, you will receive details and directions. Hope to see you there! 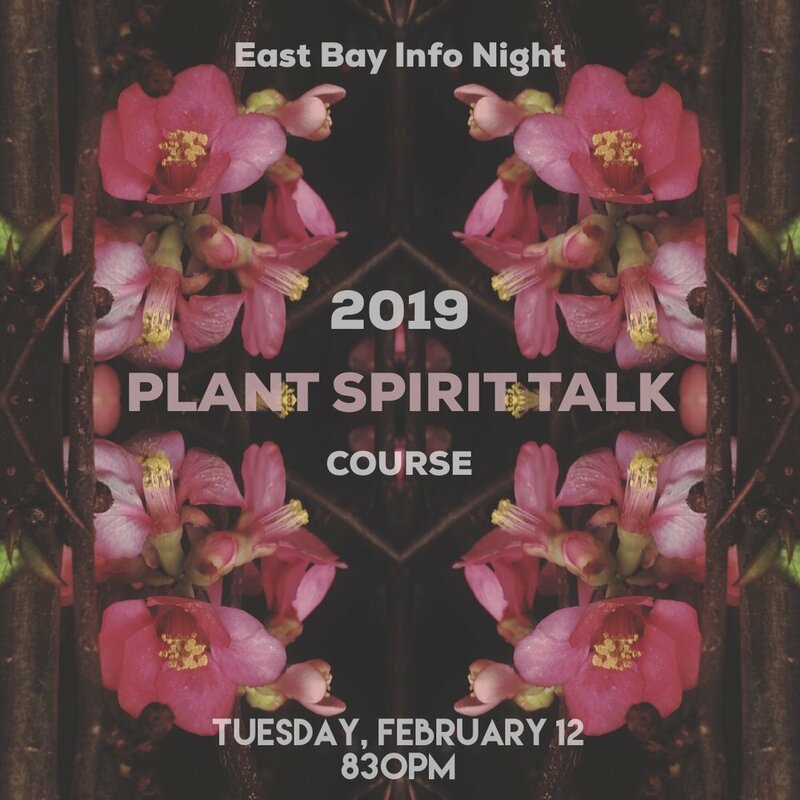 2019 Plant Spirit Talk course NOW ENROLLING! Please follow link above for more info! In this class, we will be exploring the nature of a healthy relationship and the fundamental ideals that are critical in maintaining an embodied willful relationship. Incorporating the sacred plant of Tobacco as a potent plant teacher can offer us much in learning about listening, respect, attachment, consent, praise, healthy boundaries, gratitude, and sacred reciprocity. All these will be discussed as functional tools for sustaining a fruitful reciprocal connection with Tobacco and beyond with all your relationships. In this session we will be sitting with the spirit of the Tobacco plant. We’ll explore the nature of a healthy connection and fundamentals necessary for maintaining an embodied willful mutual relationship. 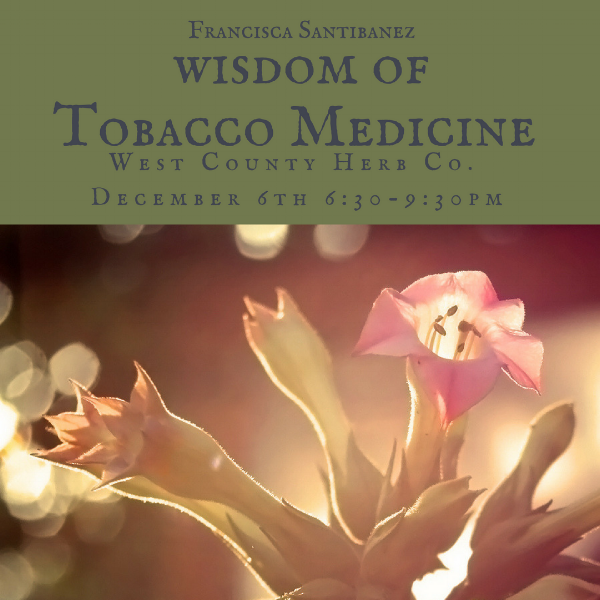 Tobacco Medicine holds powerful teachings for us, requiring clarity of intention, respect, honoring and willingness to embody our role and our truth. As a teacher spirit Tobacco can offer us deep insight and understanding about listening, respect, attachment, consent, praise, healthy boundaries, gratitude, and sacred reciprocity. Are you ready to truly choose to be in a co-creative relationship with life, nature and your body? To release blockages preventing you to connect to source? Are you ready to re-negotiate those contracts that are no longer in service to the integrity of your wholeness and wellness as the being you’ve grown to be now? Is it time for you to fully assume and embody your role as a (spirit)medicine carrier and guardian and initiate in your path as such? If your answer is YES! Then, I would love for you to join us for a three day/ two night initiatory retreat. Taking time to relax, reflect, heal, re*member, rejuvenate and rejoice! To celebrate this initiation of your engagement to your life with deepened intimacy, reciprocity, inspiration, manifestation and love! To mark the beginning of your journey of Sacred Guardianship. We will be held by sacred land and potent medicinal mineral waters at Wilbur Hot Springs, witnessed by each other, our ancestors, guides and the wise spirits of this blessed Wintun land. We will have a spacious schedule so that there will be plenty of restorative time to soak, sauna, hike, get massages and have personal time, between sessions. All meals will be vegetarian and lovingly prepared for us by our own Holistic Chef. *Space is limited. Availability of rooms are on a first come first serve basis. To register and for inquiries, please email plantspirittalk@gmail.com specifying your accommodations and dietary requests. *Price is inclusive of sessions, ritual, lodging, use of amenities & 6 meals. Wilbur Hot Springs offers private cabins with one queen bed for one or two people with a private bath; the unique Solar Lodge which accommodates 2 guests in each room with a shared bath; one Bunk room with bunk beds and a single bed accommodating 5 guests. If you register for a Solar Lodge, you will be paired up with a roomate for the retreat. If you'd like to be paired up with a specific retreat participant, please let me know when you register. The retreat ends after Lunch but you are welcome to stay on the grounds until 5pm. How are you doing? How are you processing these burning times of collective crisis? As more of our stories surface of the continued silencing, ravaging and betrayal to our sacred place in creation, how are you holding the stories of our collective trauma in your womb*mynly body? How are you tending to your own integrity and wellness? Know you are not alone. And you don’t have to hold the magnitude of this pain, grief and trauma by yourself. It is our nature to gather, to sit together, to share and hold space for one another. To create sacred space and rituals to connect; to feel together, to move energy, to see each other beyond our suffering the wisdom keeper and healer within each of us. We can connect to the spirit of life and healing, through our life giving portals. Through our embodied temple space. Through our wombs. There, the ancient ones await us. To allow and receive their embrace, their elixir of courage and strength, their life giving medicine and wisdom providing us support to move through these challenging times in our choice and power. You are invited to step into a space of holding. A space of honoring our nature, our bodies, our wombs and our stories. A space where we can remember together how to call forth our wholeness and integrity. A space where we work with our earth, her plants and her spirits. Here, you can enter as you are. We will explore ways to connect with our lineage, our grandmothers and the ancient wise ones. Through our connection, honoring and our dialogues with our wombs we will weave our truths, our medicines and our healing together in sisterhood. oin us for an evening of exploration and ritual. In this introductory class we’ll discuss and engage in some of the different approaches to enter a consensual, reciprocal relationship with a plant and their spirit. From consent, to attunement, and being in courtship to guardianship. We’ll hold at the center the intention for initiating a dynamic of right relationship, deep reflection and cohesive integration. This is a free event and is wheelchair accessible. Please join me this Saturday in Sebastopol from 6-8:30pm at this cultural fundraising event for the North Bay Organizing Project, a nonprofit organization doing grass root work providing support for under served communities in this area. It promises to be a fun evening of performances, interactive art, healing, all you can eat traditional foods, and lots of herbal goodness! I will be there sharing elixirs and celebrating the richness of community and culture. Please email plantspirittalk@gmail.com for more information. Cheers! In this session we'll be exploring the medicine of beauty. There's a standing invitation for us to tune in to the frequency of grace and joy and all the synchronicities that can help us experience a deepened intimacy with life... Beauty is in the eye of the beholder. The way we choose to meet life and hold our experiences affects our health, skin radiance and our ability to embody and feel beauty in ourselves and in the world. We’ll go over skin types and the best ingredients and plants to meet your type. We’ll be gathering in circle as we co-create sacred space for connection, healing and creation. We'll be exploring ways in which we can tune in, commune and celebrate our body's reflection on the rhythms of nature. We'll be focusing on the nurturance of sacred balance and harmony as we embrace the all emcompassing inner universe, and ancestral healing through our connection to our nature. In this session we'll be gathering to sit, journey, feel and explore the wisdom, healing and guidance generously shared by the beloved Camellia sinensis tea plant along with other delectable herbal infusions. In this session we will explore the healing wonders and magic available right out of our kitchen cabinets. Common cooking herbs and spices are some of the most accessible, well known and best used medcines for treating acute and chronic health issues. Much of traditional medicines from around the world, used by our grandmothers came right out of their kitchens. Make: Tonic, elixir & adaptogenic potion to support overall wellness. In this session we'll be gathering in exploration and celebration of AYNI- the Andean code of Sacred Reciprocity. We'll be discussing how we can embrace and embody this wisdom to provide greater support, balance and mutuality in all our relations. In this session we will discuss the benefits, structure and traditions of creating sacred relationship with our beloved plant friends. Sacred reciprocal exchange with a plant teacher. What makes you feel and look radiant? What rituals makes your skin and body feel acknowledged and loved? What kind of lifestyle supports your walk in Beauty? How can plants support your skin, body and soul to be and feel vibrant and sourced? Please join us as we explore and discuss Beauty, in life, skin, body and beyond. Learn about the benefits of using all-natural ingredients on your body and how to use these ingredients to make you own herbal skin care and beauty products. This 3-part course will offer an introduction to botanical beauty ingredients and how to choose ingredients for skin types, skin first aid, and desired effects. We will dive into processes for making a range of beauty products, including creams, facial masks and sprays, toner, scrubs, bath salts, and a relaxing spa experience with our homemade products. To sign up please go to www.ohlonecenter.org/courses or go to contact for inquires. Thank you! In this session we will be reflecting and discussing soul retrieval, ancestral healing, grief, forgiveness, working with our dreams and embracing grace. Herbal protocols and formulas for rituals to support soul integrity and remembering. In this class we'll be exploring reciprocity, clarity of intention and working with plant allies to support us in creating a healthy, inspired, beautiful & fulfilled life.